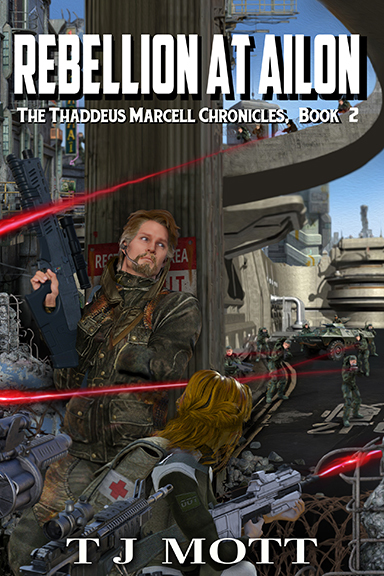 Rebellion at Ailon: Book 2 of the Thaddeus Marcell Chronicles is the sequel to Rescue at Waverly. In this story, Thad travels undercover to a world that is now enslaved as a result of his own actions as a pirate. Ailon is a resource-rich, low-population world in the galaxy’s Independent Regions. Originally a mining colony of the nearby Avennia system, Ailon once tried to break free, resulting in a brutal war which they lost after Thaddeus Marcell pirated a convoy of badly-needed weapons and matériel that was en-route to the Rebels of Ailon. Now, it’s an oppressed and enslaved world, its conquered population forced to work at gunpoint for their Avennian overlords.